It’s a good thing there’s CSA Tuesday, or I’d never be posting anymore! I’m so sorry I haven’t been posting much lately but I’m around, just really busy. Hopefully things will calm down a bit sooner than later and I’ll go back to blogging more regularly. 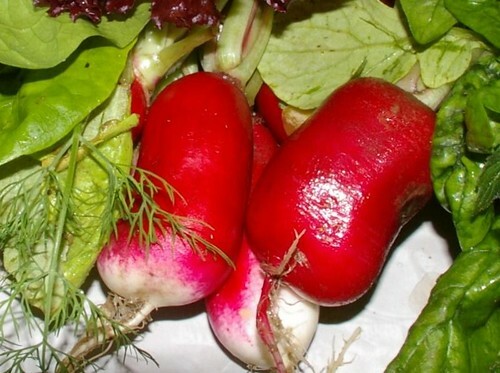 Today’s CSA was again on the small side, except for the radishes. We got a bit of 2 different kinds of lettuce, some more spinach, some dill and 2 bunches of the biggest radishes I’ve ever seen. These things are at least 1.5 inches to 2 inches long. But they’re delicious with bread and butter (thank you Deb for the tip! ), yummy in salads and very good boiled. On Sunday morning, DH and I went to pick our quart of strawberries and peas that were part of last week’s share. Even though it was rainy and gray, we had quite a good time. The strawberries are delicious and I am looking forward to cooking the peas. This week again we can go pick a quart of strawberries and peas, hopefully we’ll have better weather this Sunday. 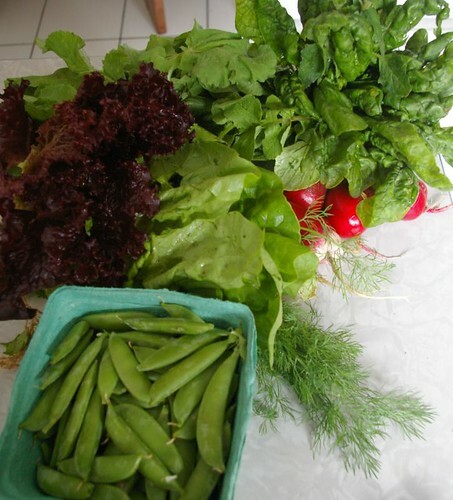 See you next week for another CSA Tuesday if not before! If you want some kale and arugula, I’ve got tons! My peas and beans aren’t really doing anything yet with all this rain though. Told ya! Glad you liked it!